Looking for a new accessory to take your look to the next level? Look no further, because our black stainless-steel crocodile skin pattern inlay offers the best of both worlds: luxurious steel and a slick animal print to elevate your ensemble in an effortless way. This fashion ring is the ultimate statement piece and will surely demand double takes as you make your way to the bar, your office, or anywhere your adventures lead. 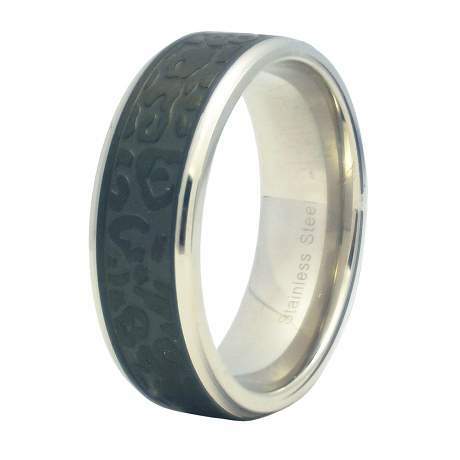 Our men’s black stainless-steel crocodile skin inlay ring is available in multiple sizes, and all of them feature an 8mm band with a polished finish that will gleam for years to come. 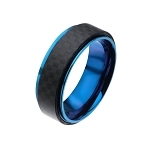 Wear it every day or wear it as a wedding band to commemorate your commitment in a special way. The black stainless-steel crocodile skin pattern inlay is a true showstopper. In lieu of precious metals, more men are experimenting with alternative metals. Stainless steel has long been used to produce gentlemen’s accessories, so it’s no surprise that grooms are choosing this alternative metal more than ever before. Best of all, stainless steel is highly resistant to scratching, corrosion, and tarnish. 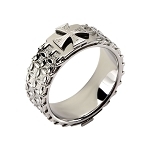 Our men’s black stainless-steel crocodile skin inlay ring will shine for a lifetime. This fashion ring features a traditional fit, so you may want to have your finger sized for accuracy before finalizing your order. If you have any questions, please contact JustMensRings.com today for additional information or further assistance. Let us know how we can help!